Climate fluctuation and changes in our region are closely linked with the heat that is brought from southern latitudes by ocean currents and sea breezes. Without the Gulf Stream and the westerly wind belt, Norway would be 10–15 Celsius degrees colder. Global warming can result in changes in ocean current patterns and the Gulf Stream system, for example, if significant portions of the inland Greenland Ice Sheet melt. The Earth gets more heat from the Sun at the equator than at the poles. This imbalance is corrected by heat being continuously transported towards higher latitudes via large-scale sea breezes and ocean currents. In terms of ocean activity in this respect, the Gulf Stream is the prime mover. The Gulf Stream plays a key role in creating our mild climate, because the westerly wind belt across Europe gets its warmth principally from the Gulf Stream. The Gulf Stream system – from the Gulf of Mexico through the North Atlantic Ocean and partly into the Norwegian Sea – emits heat into the atmosphere in the north. The warm current on the clean surface is balanced by a colder, southbound returning current in the Atlantic Ocean (see Figure 1). The southerly current runs both on the surface and in deep water. Figur 1. Extension of the Gulf Stream toward the Arctic. The figure shows how the warm Gulf Stream gradually cools on its journey northward through the North Atlantic and into the Norwegian Sea until it meets the ice in the Arctic (grey area). Cold water flows back, both on the surface and in deep water. Illustration: Marius Årthun, UiB/Bjerknessenteret (temperature data from www.metoffice.gov.uk/hadobs/hadisst/). By the time the Gulf Stream reaches our latitudes, it has been so greatly cooled (and is therefore heavier) that it mixes with the water below it. The deep returning current consists of these «newly mixed» bodies of water. The mixture must correspond with the strength of the current, or else the system's equilibrium is altered. The source of the heat that the Gulf Stream brings to the north is the sun. This heat absorption must also be in balance with the strength of the current if the system is to remain stable. What happens if the Gulf Stream stops? 5 degrees Celsius colder than normal for our latitudes. The climate models show that the strength of the gulf Stream system can be weakened by about 10–30 per cent in the course of the current century if global warming continues. This means reduced heat transport by sea from the south to the north. However, since rising air temperature more than compensates for the reduced heat carried by ocean currents, the temperature will rise in Norway even with a weakened Gulf Stream. It is nevertheless true that we anticipate that the eastern branch of the Gulf Stream system – the one that flows into the Norwegian Sea just north of Scotland – is sustainable even if the Gulf Stream should be weakened further south. It is possible, however, that the areas near Iceland and South Greenland will experience minor temperature increases as a result of a weakening of the western branch of the Gulf Stream. Dokken, T.M., et al., 2013: Dansgaard-Oeschger cycles: interactions between ocean and sea ice intrinsic to the Nordic Seas, Paleocean., 28, 491-502. Eldevik, T., et al., 2014: A brief history of climate – the northern seas from the Last Glacial Maximum to global warming. Quat. Sci. Rev., 106, 225–246. Glessmer, M.S., et al., 2014: Atlantic origin of observed and modelled freshwater anomalies in the Nordic Seas. Nature Geoscience, 7, 801–805. Hátún, H., et al., 2005: Influence of the Atlantic Subpolar Gyre on the Thermohaline Circulation. Science, 309, 1841–1844. Onarheim, I.H., et al., 2015: Skillful prediction of Barents Sea ice cover. Geophys. Res. Lett., in press. The heat transported into the Norwegian Sea corresponds to approximately 50 times the world's total energy consumption. The deep currents from the Norwegian Sea to the Atlantic Ocean are responsible for two-thirds of the deep-water returning current in the Atlantic Ocean. The Gulf Stream can be reduced by up to 30 per cent over the next 100 years. The climate in Europe will nevertheless be warmer. However, a weakening is not expected to occur during the next 10–20 years, and the system may be able to «heal itself» even in the event of major changes. The Gulf Stream's branch into the Norwegian Sea is of key importance for understanding climate fluctuations during the final years of the Last Ice Age. 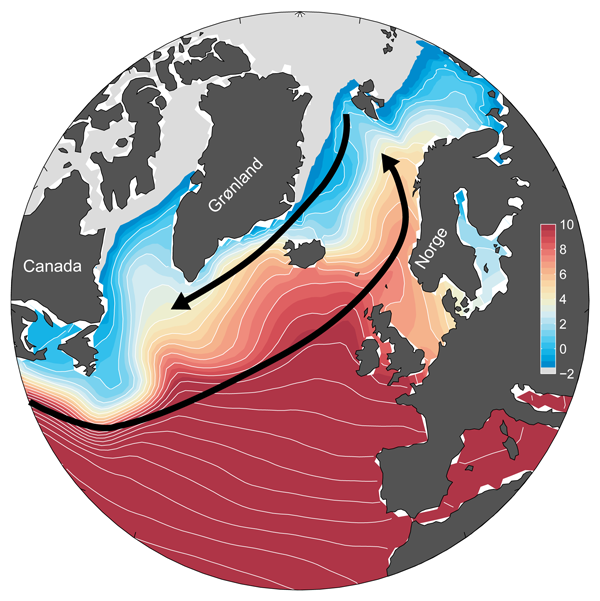 The role of the Gulf Stream system, and particularly its extension into the Norwegian Sea and the Arctic region, in the climate of the past, present and future.